Hello everyone! I'm Vivian Lake and today I'm sharing with you a new layout using the Toolshed kit: Winter Adventures from International Scrapbook Garden. This page is inspired by long perusals thru my Pinterest page. I liked several techniques by various artists and decided to try them on this layout. I admit I was rather nervous with how this was going to turn out. It's so rare for me to not follow a sketch or even to lift from another scrapper's page. I will say I was greatly inspired by Sivan Amedi Shem-Tov. If you are curious about the photo and it's story, please catch up with me at my blog. Most of this layout is from the Winter Adventures kit and bonuses. I did use kraft card stock from my stash. I also used Lindy's Stamp Gang embossing powders as well as my sewing machine! Sometimes it's hard to know what title to use on a layout. Some crafters don't use any but that's not my style. I do tend to not journal on the front though. But lately I've been journaling on the back so family and friends will still know the story. I used embossing powders Silver Moon Mistletoe and Cleopatra's Copper on the snowflakes. 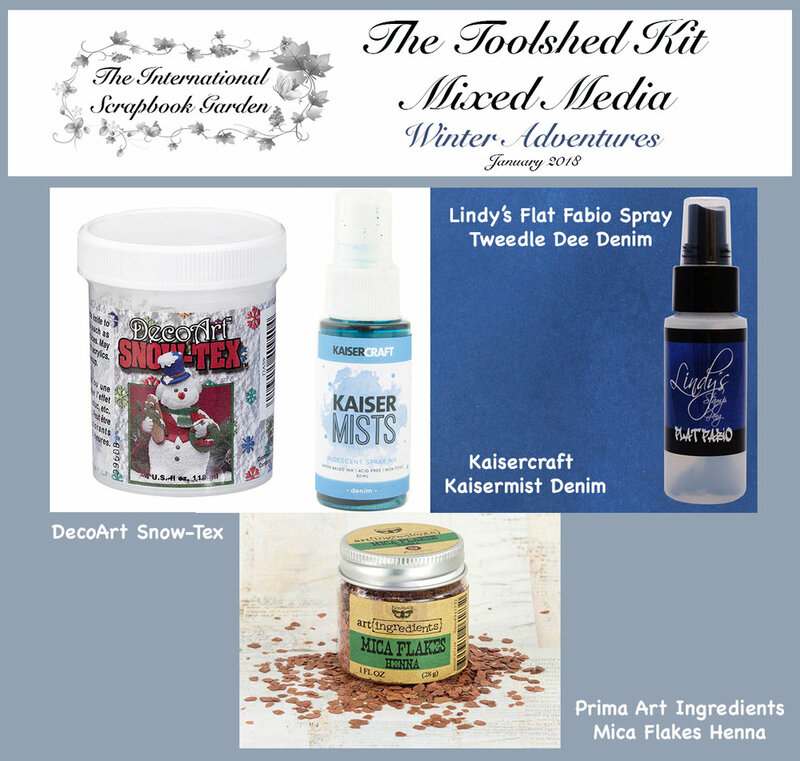 I lightly spritzed Kaiser Mists Denim available from the mixed media bonus kit. I added the DecoArt Snow-Tex all over the flowers, and dabbed it across the layout for effect. I used my rather old Fiskars paper crimper on my kraft card stock for extra texture. The denim papers provided in the kit really "scream" sewing and stitching to me. I did add some snowflake stenciling (provided in the bonus kit) using white Acrylic paint. I also distressed the papers with Prima Rose ink Branch Bark provided in the main kit. THANK YOU FOR STOPPING BY TODAY!! Hi all! I am so excited to share my first layout created with the Toolshed kit: Winter Adventures from International Scrapbook Garden. All of the kits from ISBG have been amazing, and this one made my heart do a little happy dance. The funny thing is that it is ostensibly a winter kit, but I found myself scrapping some summer pictures (even though we live here in Minnesota and you'd think I would have a gazillion winter pics!). I didn't have any printed and I couldn't wait another single minute to dig in and get my fingers all glue-sticky. But there is so much versatility here, it didn't really matter. The papers in this kit are from Maja's Denim and Friends collection. I am in LOVE with this collection! It's been a running theme here, trying to scrap "boyish" when I am naturally drawn to pink and flowers. With these papers, and everything in the kit, I didn't feel like I was missing out on anything. I love love love these Quote Chips from Tim Holtz! Stop on over to check out the Winter Adventures Kit from International Scrapbook Garden and grab one before they are gone. And be sure to join our Facebook page for more ideas and inspiration! And don't forget to join in this month's challenge (open until February 15th) for a chance to win $25 to the shop! Have you ever found yourself needing a quick card for a holiday and you don't have that holiday's special papers? If so join the club! Today at the International Scrapbook Garden blog, I want to show you a quick Valentine made from (gasp!) Christmas papers. Today I was at my day job and had my two breaks and lunch to finish a card, including drying time. So I packed up a small kit before I left for work and decided I would see what happened. Everything fit in a 1 quart bag in my tote. I needed to make my card in a couple of steps to have everything dried and ready to assemble on my afternoon break. After cutting the two base pieces from Christmas papers and adhering them to each other, I used the stencil and the Tidy Widy Texturez. I used an old credit card I carry with me to apply the medium over the stencil. This paste is super white, which I love. I put a thin layer on and some of the red shows through, so it ended up having a pinkish shimmer. Often I am super careful to get a very even layer, but I wanted some rough interest on the card. The photo above is wet. At the same time I punched the heart out. I used the Viva glitter around the edges. To keep my workspace clean for this and to have a place to dry, I used a trusty yellow post-it note. That way I could move it out of my workspace to a drying area, while I was doing my day job! Here is a close up of the heart and the stencil on the card. See the pinkish shimmer? Cool huh? So I used some beautiful Christmas papers and some great mediums. Who would know it's Christmas paper? A new kit will be debuting in the next few days and we have some talented new members of our team. Save 10% off your Kits every month! Subscribers who refer a friend to also become a subscriber will receive a Bonus Kit of your choice for free! Welcome to the International Scrapbook Garden!